First up is Luke’s choice. I stumbled across Freschard via WYAIWYA, who put out my December choice, Leaf Library. I absolutely love her laid back, quintessentially French, delivery on everything, that makes me think of if Jacqeuline Taieb ever put her hand to indie pop. 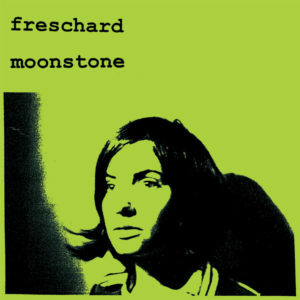 Moonstone was originally released back in 2008, but didn’t get a vinyl pressing until last month, and it’s full of beautifully simple pop tracks. Personal favourite is the gently plodding opener I Hear You. It’s just so damn French. Next up is Ali’s choice. This 12″ is the second single from Wilma Archer. Originally from Newcastle Upon Tyne, Wilma has been composing, producing and releasing music for almost a decade (under his other moniker Slime) and this single follow on from last years ‘Like A Hunger’ featuring Amber Mark. The track is composed of 4 different movements, each seeing a different instrument take the lead, leading to a gorgeous crescendo. Easily the most daring, original and virtuoso music he’s made to date, ‘Scarecrow’ takes Archer’s prodigious musicality to a whole new level – enjoy!